Genevieve Plaster, M.A. | December 5, 2014. On November 20, the Charlotte Lozier Institute and Family Research Council launched a new website to expose which health insurance plans on the Obamacare exchanges cover and do not cover elective abortion for the 2015 enrollment period. The website, ObamacareAbortion.com, is a joint effort between the two groups. Researchers have examined new plan documents, contacted insurance carriers and the exchanges seeking plan information. They also referenced the 2014 Government Accountability Office report that provided a list of 1,036 plans that covered abortion on demand and were eligible for federal tax subsidies in 2014. The groups hope this new online tool will aid Americans who want to make fully informed healthcare decisions and avoid inadvertently purchasing a plan covering abortion on demand. Connecticut’s exchange, AccessHealthCT, is state-run (a majority of the exchanges are managed by the federal government or through federal-state partnerships) and has four carriers providing coverage in the individual marketplace. They are: Anthem Blue Cross/Blue Shield, ConnectiCare, HealthyCT, and UnitedHealthcare (new to the marketplace in 2015). In 2014, Connecticut was one of the five states that did not have any elective abortion-free plans on the individual marketplace. This year, Connecticut was added to the Multi-State Plan Program and will have six new multi-state plans (MSPs), four of which do not cover elective abortion according to plan documents. The two Connecticut MSPs that do cover elective abortion appear to be the only MSPs for 2015 that do besides the two in Alaska that covered it in 2014. UnitedHealthcare, new to the marketplace, will cover abortion on demand in all individual plans according to its 2015 plan documents. The addition of the non-elective abortion coverage MSPs is a partial victory for Connecticut families, in particular Barth Bracy and his family, who sued to challenge the lack of choice that forced them to pay into an elective abortion plan. Alliance Defending Freedom representative Kerri Kupec joined Rep. Chris Smith (R-NJ) and representatives from Charlotte Lozier Institute and Family Research Council at a press conference on Capitol Hill on November 20 to highlight this partial win. The District of Columbia’s exchange, DC HealthLink, is state-run and has three insurance carriers providing coverage in the individual marketplace. They are: Aetna, CareFirst Blue Cross Blue Shield, and Kaiser. The plans that exclude elective abortion for 2015 appear to be the same options that did so in 2014: all Aetna individual plans and the multi-state plans offered by CareFirst Blue Cross Blue Shield. In 2014, DC HealthLink responded to an article that relayed incorrect information given by multiple DC Healthlink representatives who said that all of its plans covered elective abortion as an “essential benefit.” Officials posted a clarifying Frequently Asked Question that noted the exclusion of abortion coverage in the Aetna and MSP options. For 2015 (as of the publication date of this blog), this abortion FAQ no longer exists on DC Healthlink for consumers to view.. While this old link to the FAQ (provided by various 2013 articles) still works, it no longer shows online if one manually clicks through each category’s FAQs or if one types “abortion” in the FAQ search box. It is unknown whether the question was intentionally pulled from the site or was accidentally not transferred during site maintenance. Though now missing, this original FAQ represented an approach to clarity that could have easily been duplicated in other state exchanges; however, no such information has appeared to our knowledge nor has it been suggested in any guidance from the federal government. New York’s exchange, New York State of Health, is state-run and has 16 insurance carriers offering coverage in its individual marketplace. Wellcare is the only new carrier to the marketplace for 2015. 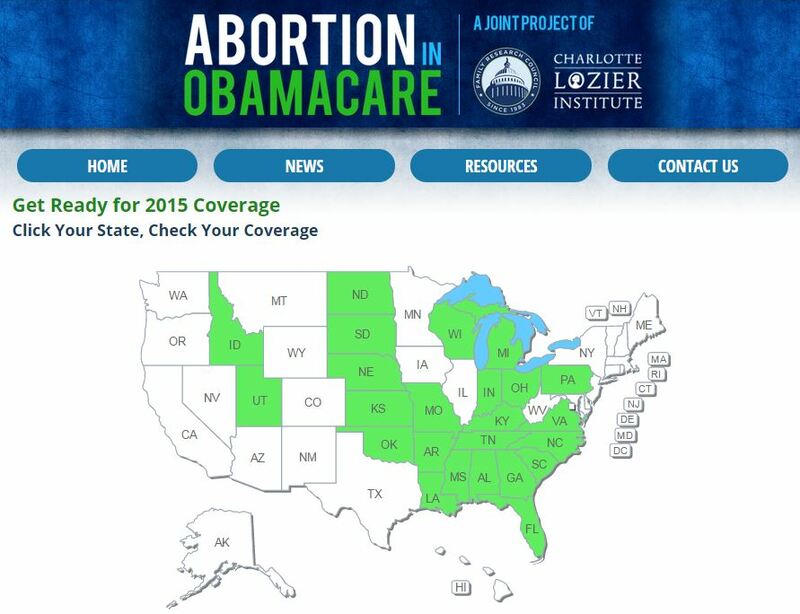 For 2015, five of six carriers that are expanding to offer more plans will cover elective abortion. The only carrier that has excluded elective abortion coverage from all of its plans (on and off the New York exchange) for 2015 is Fidelis Care, a Catholic-run company that is forthright about this exclusion on its plan documents and website. On November 15, opening day for Obamacare, New York State of Health was closed. CLI called the customer service number and dialed through automated menu options only to be finally transferred to a voicemail that announced the exchange’s closure and that office hours are Monday through Friday. Wellcare, the only new carrier, has provided conflicting information. On opening day, a customer service representative stated that they only offer Medicaid plans. Another call two days later yielded the response that their five individual plans “unfortunately” exclude elective abortion, but the representative could not provide any plan documents stating this. A follow-up call on December 1 resulted in the representative stating that all plans cover elective abortion. The week of opening day, the Wellcare website for plan documents showed a blank page except for the words, “Coming Soon!” Since then, plan documents have been posted; however, they remain silent on abortion coverage. An Emblem Health representative on November 15 said over the phone that all plans did cover elective abortion “because of a New York state mandate.” This does not appear to be the case, especially as FidelisCare’s qualified health plans currently exclude it. Vermont’s exchange, Vermont Health Connect, is state-run and has two carriers offering individual plans on the marketplace. They are: Blue Cross Blue Shield of Vermont and MVP Health Care. In 2014, the GAO Report found that all of Vermont’s individual plans covered elective abortion. It appears that this will remain the case for the new year as BCBS of Vermont and MVP continue to be the only issuers and there are no multi-state plans for 2015. Washington’s exchange, Washington Healthplanfinder, is state-run and has 10 insurance carriers offering individual plans on the exchange. They are: BridgeSpan Health Company, Community Health Plan of Washington, Columbia United Providers, Coordinated Care, Group Health Cooperative, Kaiser Permanente, LifeWise, Moda Health Plan, Molina, and Premera Blue Cross. In 2014, the GAO Report found that all of Washington’s individual plans, except for Premera Blue Cross Blue Shield’s multi-state plans and those from Group Health Cooperative, covered elective abortion. For 2015, all of the Group Health Cooperative individual plans have now been changed to cover elective abortion, per the 2015 Summaries of Benefits and Coverage that lists “voluntary termination of pregnancy” as a covered service. Out of 90 individual plans, only eight exclude elective abortion, meaning more than 90% of Washington’s individual plans cover abortion on demand. On November 15, the first day of open enrollment, the Washington exchange was shut down due to miscalculations of tax credits. Lack of transparency on abortion coverage in health insurance plans is only the tip of the iceberg. Because abortion is the only medical procedure that intentionally take a human life, it is not healthcare and as such does not belong in health insurance plans, nor should its coverage be hidden from consumers or buried deep in plan information. In addition, though individuals may be living in a state that has passed legislation barring elective abortion coverage from its exchange, one’s federal taxes are still being used to subsidize abortion plans in other states. Federal legislation such as the No Taxpayer-Funding for Abortion and the Abortion Insurance Full Disclosure Act, therefore, are necessary to correct this broken system.